Heat oven to 375°F. In medium bowl, stir cookie mix, water, 3 tablespoons oil and the egg until soft dough forms. Stir in peanut butter pieces. Drop dough with ice cream scoop onto ungreased cookie sheet. Flatten in crisscross pattern with fork. Bake 9 minutes. 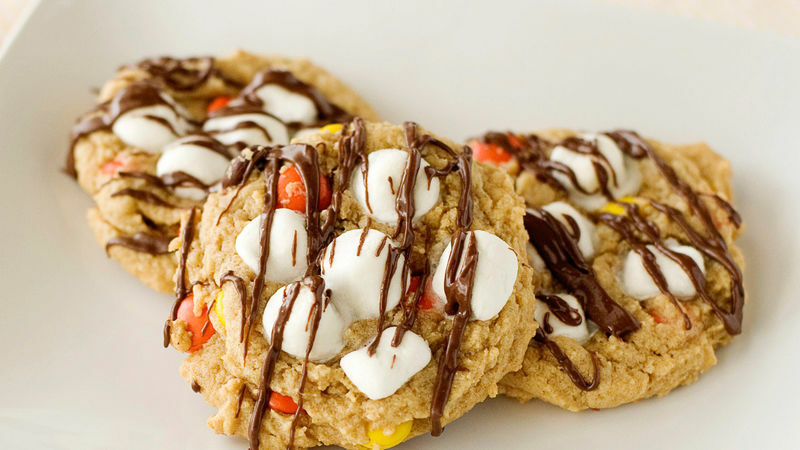 Press marshmallows onto cookies. Bake 3 minutes longer or until cookies are golden brown. Cool 2 minutes; remove from cookie sheet to cooling rack. Cool completely. In small microwavable bowl, microwave chocolate chips on Medium (50%) 30 seconds. Stir; continue to microwave in 10-second increments until melted. Add 1 teaspoon oil; stir until smooth. Drizzle chocolate over cookies. These cookies keep for 1 week stored in a tightly covered container. Make a sweet and salty version by stirring some crushed pretzels into the dough. They add a nice crunch too!